If you haven't seen the Meet Coralee video, or read any of the guest Q&As I've done, you might not know that the original inspiration to start Shortcake came from my first daughter Daisy's baby book. Or rather, the lack thereof. A baby book is one of those things that moms really want for their babies, but never have the time to get around to. And so we feel guilty that we are not being "good moms". Ugh. But I had taken plenty of photos of Daisy over her first year that were saved in the cloud (I auto-backed up my iPhone photos to Dropbox), and I had shared all of the highlights of her first year with friends and family on Facebook. So I knew that I had captured all the dates and photos of her year. Plus what I had shared on Facebook meant I also had saved the extra little descriptions I wrote, locations, and comments from loved ones. That was my lightbulb moment. Wait - everything I would put in her baby book is already out there, saved on Facebook & Dropbox. There has to be some company out there that will help me turn that into an album for her. I started looking, and I found the usual suspects of mass-market photo book companies, plus some newer brands that would auto-create an album for you from your social content. But none of those felt personal, they either still involved a lot of work from me to design them or could not be customized at all, and none of them would last through the years so that they could be passed down as an heirloom and reminder of this special time. I felt like I was on to something. 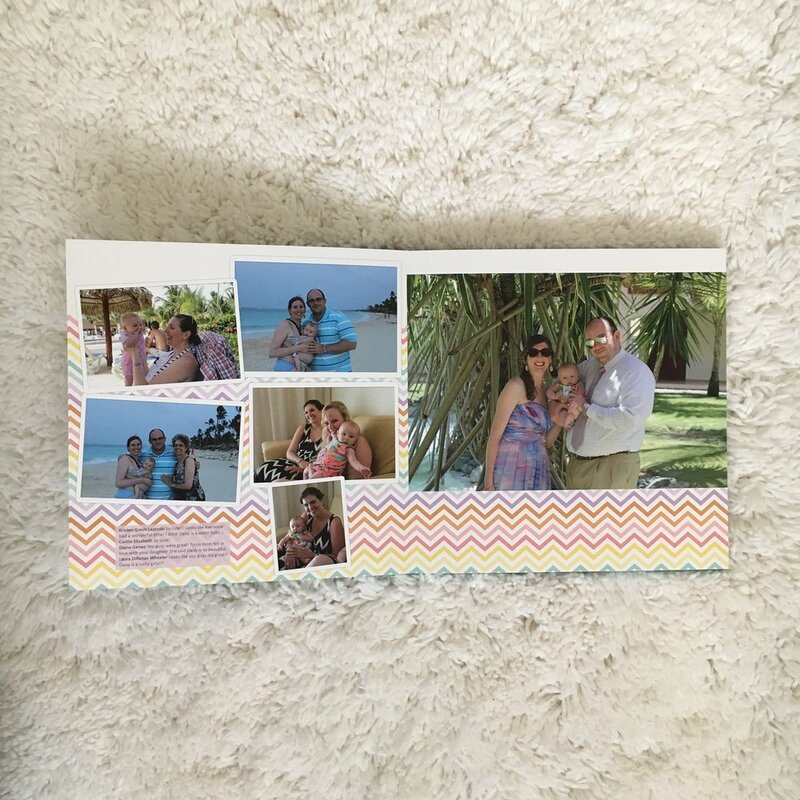 Fast forward to the present, and Shortcake is creating the custom, beautiful, premium albums our clients love. And I love providing this service and seeing how happy we are making each of our customers. But what about Daisy's album? Have you ever heard of the saying "the cobbler's wife has no shoes"? Well that was me. I spent so much time and energy building Shortcake for our customers, and never made albums for my own family a priority. A year and a half later, and Daisy's baby book is here! And it feels SO great! To create Daisy's baby book, I had one of my designers pull the content from my personal Facebook page and my Dropbox folder where my camera photos were stored. I chose the design "My First Year (Pink)" for her album, and the max number of pages (100), because I wanted it to include as much as possible (first baby = I had taken a lot of photos!). 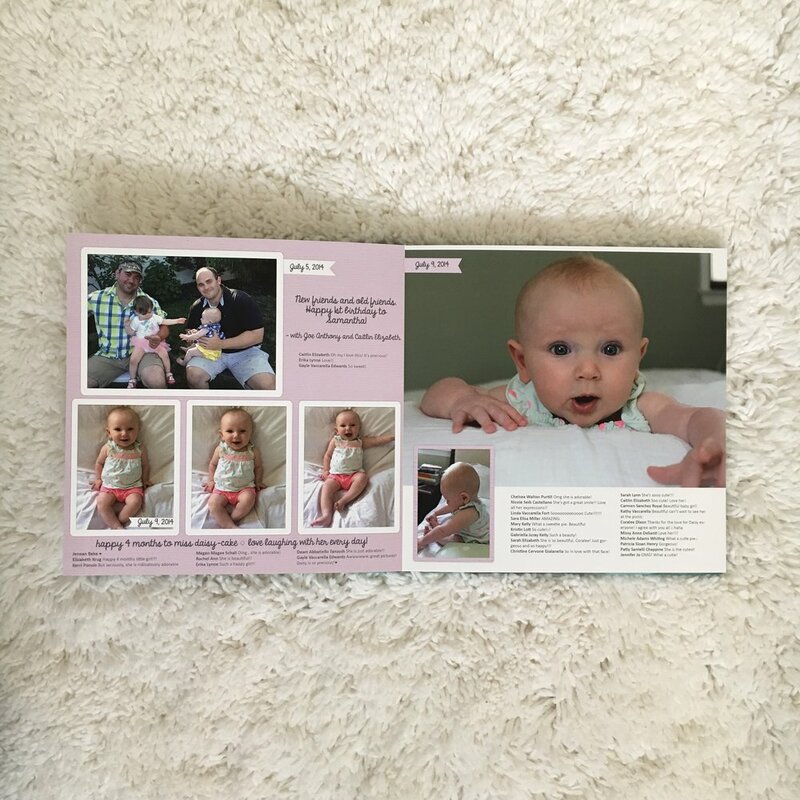 We added some touches that I like to offer our clients when we create baby albums - like an "Almost Here" section of pregnancy photos in the beginning, and a List of Milestones at the end. Looking at the images, you can see how her album includes information like her birth stats, monthly photos, dates, locations, comments, and other milestones - all because I had shared that information on Facebook. I didn't have to go back and find any of that information - it was all in my timeline. Once the design was complete, I ordered a print copy for our home - a 10"x10" Signature Album with a linen cover in "Summer Breeze" and debossed title. The album arrived a few days ago, and I can't tell you the feeling of satisfaction and completeness it gives me, like the journey has come full circle. Even more so now that our new baby has arrived. I so wanted Daisy to be able to see all her baby photos now that she has a little sister, to give her that perspective and knowledge that she was this little once, too. Daisy, Brian, and I have all enjoyed looking through the album together a few times, and I am so proud every time Daisy asks to look through it or when I put it on the shelf next to our other albums.